In the weeks following Kristin's death, we began the establishment of the Kristin Rita Strouse Foundation. We searched for a symbol that would represent our mission around mental health issues, and turned to Kristin's artwork for our inspiration. We were immediately drawn to a 24 by 48-inch oil painting of a single pale yellow dress, completed by Kristin in the spring of 2001. It was the fourth in a series of paintings on the yellow dress theme, which Kristin had begun in 1999. On April 30, 2001, Kristin wrote in her diary, "I am happy with my painting of the yellow dress." Indeed, she was extremely proud of her creation and decided to take it to Parsons School of Design, to hang in her dorm room. It turned out to be her final work in oil. Joseph Campbell stated that "Art is the reflection of one’s inner most truth brought to consciousness." A painting can be understood as a language in which the artist's line, color, and form replace words. The yellow dress painting came out of the creative imagination of Kristin, and is a living symbol of her being. We are invited into her world and by the same token into the depths of our own worlds, too, as we reflect on this work of art. The color yellow bathes the whole canvas, reminding us of the life giving energy of the sun. It is delicate and inviting as it mixes with whites and grays. 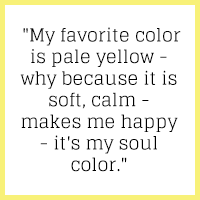 On April 26, 2001, Kristin wrote, "my favorite color is pale yellow - why because it is soft, calm - makes me happy - it's my soul color." There is strength and creative abandon to the application of paint. We know there was joy and pride in her completed work of art. Her choice of painting a dress was a tribute to her passion for beautiful clothing, so fitting for an aspiring fashion designer! Ann and Barry Ulanov write, "Imagination delivers us over to paradox, to the contradictory, where positives and negatives collide as the struggle between the ideal and the reality take form." Kristin consciously left us with the bright and positive creation of her yellow dress. Since her death we have searched for answers and considered the possible unconscious processes at work in this yellow dress painting. The form of the dress merges with the background, giving the impression of something that is there and yet not there at the same time. There is a transparent quality to the dress form, in addition to a certain lifeless and flat rendering perhaps suggesting a depressed mood. The dress is loosely hung on a hanger with the actual hook, bent upside down, in the pictures frame. Together, the dress and hanger do not appear to be secure or attached to anything, giving rise to a sense of ambiguity. In consideration of the final elements of the painting, we may have an unconscious indication of the results of Kristin's struggle with herself, in a less than perfect world. We believe the painting portrays her paradoxical struggle between life and death, joy and sadness. Carl Jung stated, "An image is symbolic when it implies something more than the obvious and immediate meaning." We offer to you Kristin's image of The Yellow Dress as a symbol of life, in all its complexities. We envision The Yellow Dress as a timeless and powerful symbol of our promise to bring life, light, and hope into this world through education and awareness of mental health issues.